Hello! I just found your comic through the links page of the Door Toilet Genie comic’s website (which I must now go read, since I got distracted and read Thistil Mistil Kistil instead xD). I’m loving this comic. In a “manga-style” dominated media it’s refreshing to see individual styles! And did Coal’s eyes change color? A result of the godly beer? You are correct Betsy! Eyes are a common motif in the comic (lookit my big words) and Coal’s eyes especially are important to pay attention to. ;3 I’m glad you like the style too! Even within manga there are lots of different styles, but sometimes I want something different. I love webcomics because there are so many different styles to look for and admire, done by people all over the world. Thank you for reading! 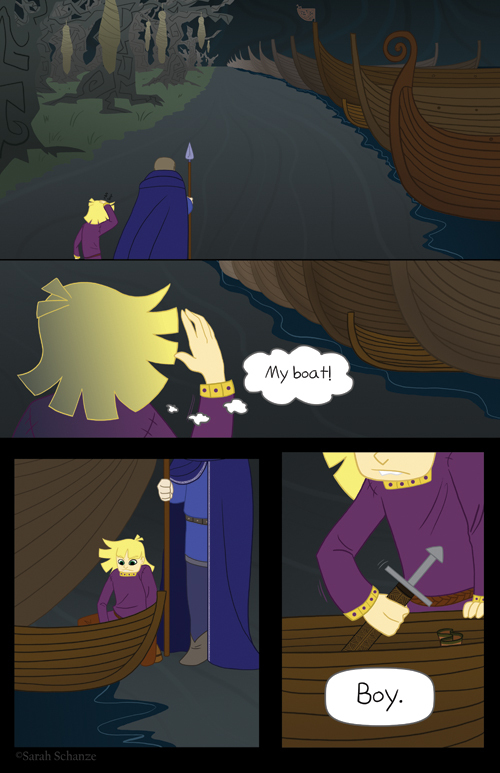 d’aww Coal had such a teensy boat! Ah, speaking of eyes, i sse that Odin has one blue, one black. Assuming this is after his sacrifice at the well, i’m guessing the black one is actually the empty socket where one is missing. You are correct! 😀 Pretty much all the major myths have already happened, except for Ragnarok of course, and the major events leading up to it. So does that mean Baldur is dead? wow, just started reading this and I love it! Your art style, what we’ve seen of the characters so far and the norse mythology is fantastic! Whats the forest in panel 1? it looks like…people… wrapped up and hanging from them. Are they the vikings who didn’t die in battle? Neil Gaiman’s “American Gods” has a pretty graphic depiction of this as the main character gets to enjoy being the guest in the ordeal. Mr Wednesday and Low Key Lyesmith team up on a con job. Interesting read.